The discovery of the Philippines is linked to Spain’s glorious chain of conquests. On September 20, 1519, a fleet of five galleons commanded by Portuguese Navigator Ferdinand Magellan and discovered the 7,100 island archipelago in the fareast. Magellan took possession of the islands and named it after King Philip of Spain, now known as the Philippines. He made the island of Cebu the base of his exploration, Christianization and conquests. King Humabon and Queen Juana of Cebu gave him a warmth reception and embraced Christianity along with their subjects. Magellan’s friendship with King of Cebu had dragged him to war with the neighboring tribe of Mactan. Magellan was killed in the battle and his defeated forces subsequently forced to return to Spain. In 1565, Spain made another expedition to the Fareast Region. An Augustinian priest and world-known cosmographer, Padre Andres Urdaneta, who lived inside the monastic walls of the Augustinian monastery in Mexico City was summoned to lead the expedition. In November of the same year, a memorable expedition left Mexico City for the Philippines carrying with them the Image of our Lady Guadalupe, arrived in Cebu on April 27, 1565. 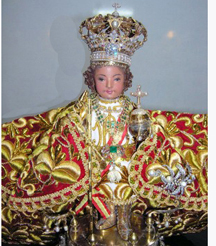 The findings of the image of Santo Nino is one important clue that Christianity continued to flourish after the Spaniards left the islands and before the 2nd wave of missionaries arrived in the Philippines.